Kelly Menswear is an Irish owned family business, employing skilled tailoring staff and using the finest quality Irish and European materials. 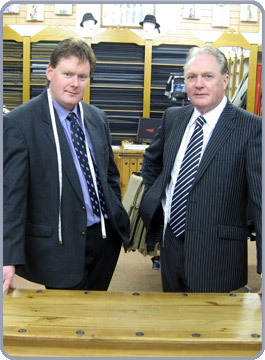 With over 60 years experience, Kelly Menswear has established itself at the centre of Irish tailoring since 1993. Our unrivalled experience is at your service. We have a huge range of fabrics for you to choose from. A personally tailored suit looks fantastic. You’ll never get a better fit. On to two fittings during fabrication ensure results. Finest quality Irish and European materials. Why not visit our new Irish Tweed Jackets website. Tom Kelly (right) with son David.